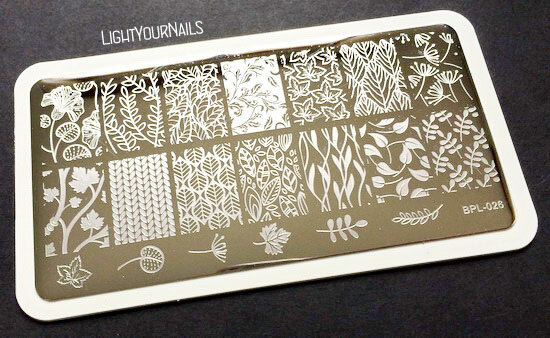 Metallic black and silver stamping | Light Your Nails! Dopo avervi parlato dello smalto Color Club On The Rocks, ed avervi anticipato che funziona benissimo per la tecnica dello stamping, non potevo che darvene le prove! After showing you Color Club On The Rocks and telling you it works for nail stamping I couldn’t but prove you it’s the truth. Ho scelto volutamente un’immagine che avesse linee abbastanza sottili per testarlo al massimo, e come potete vedere è assolutamente promosso. Ovviamente parte del merito va dato anche a questo dischetto dell’e-shop BornPrettyStore, che continua a darmi soddisfazioni quando si parla di accessori per lo stamping, che siano smalti, tamponi o dischetti, come in questo caso. Di questa nail art mi piace molto l’abbinamento dei colori, un classico! L’immagine forse non era troppo adatta, ma come ho detto l’ho usata per le sue linee sottili. Voi cosa ne pensate di questa manicure? I picked a pattern that had fine lines because I really wanted to stress test CC On The Rocks and as you might see it worked perfectly. The quality of this stamping plate obviously helped. I have to say BornPrettyStore hardly ever disappointed me when it comes to stamping accessories, may them be nail polish, stampers or plates. I like the colours in this nail art, it’s a classic combo. The pattern might not be the best for them but as I’ve said I’ve picked it for its thin lines. Do you like this manicure? Claro que ficaram lindas demais. I'm in love with this mani! I will be getting On The Rocks now also because it stamps! Haha and I know you like Color Club as much as I do! It looks classy! I like it a lot. This is gorgeous! I actually love that whole plate, everything is so leafy! Thank you! I love everything flowery and leafy, too! This is gorgeous! I love that silver against the black! This is beautiful! It looks so effective! WOW! Great result, love it! It stamps beautifully and I love how dramatic this mani is. So gorgeous! Love the look of silver over black! This is perfect!!! Love the design. How did you find this plate? I have heard some...things about it. I've used 7 patterns out of it already and they all worked perfectly for me. So beautiful!!!! I love this design! Great mani! Love the contrast of black and silver. Color Club polishes are awesome. Beautiful mani. Thank you! I really like Color Club, too.